Due to population aging, increase in chronic disease and increased life expectancy, the number of people living with more than one chronic condition is increasing. It is estimated that 50 million European citizens suffer from multimorbidity (http://ec.europa.eu/health/ageing/docs/ev_20151007_frep_en.pdf). Among people over the age of 65, about 65% have multiple chronic diseases; for individuals aged 85+ multiple chronic diseases' incidence is estimated at 85%. Therefore, the number of people living with multimorbidity in the Europe is expected to increase further. Multimorbidity (living with two or more medical conditions where one is not necessarily more central than the others - https://ec.europa.eu/eip/ageing/news/conference-which-priorities-european-policy-multimorbidity-27th-october-organized-european_en) has attracted significant attention among policymakers and stakeholders, also because adults with multimorbidity account for more than two-thirds of health-care costs. Multimorbidity impacts several levels of civil society: The individual (the quality of life of patients and their families), the quality and organization of health-care services at a local level and the whole healthcare system (health and social care services as well as high public and private expenditure). Patient adherence is defined as the extent to which a person's behavior, (taking medication, following a diet, or executing lifestyle changes) corresponds with agreed recommendations from a health care provider. Polypharmacy and patient adherence and the importance (Scottish Polypharmacy 2015 guidance. Model of care group, Scottish Government 2015. http://www.polypharmacy.scot.nhs.uk/) to involve patients and families with regard to goal setting are problems that patients with multimorbidity are facing. More specifically polypharmacy is associated with several risks, including adverse drug reactions, risk of medication and disease interactions, and inappropriate dosing and adherence. On the other hand, patients could benefit from multiple medications if properly addressed when medications are combined to cure, slow the progression or reduce the symptoms of the diseases. As the consequence of morbidity, polypharmacy is associated with age and poor self-rated health. Furthermore, many patients with multi-morbidity experience difficulty in following (agreed upon) treatment recommendations. According to the WHO, only 50% of patients are adherent to long-term therapy for chronic illnesses. Consequently, if patient complexity can be challenging when addressing treatment goals for one condition, it will become ever more complex when attempting to prioritize treatment targets for multiple conditions. Of course, despite the growing number of people with multiple chronic conditions, the majority of treatment guidelines focus on single disease and rarely address how to optimally integrate care for people with multimorbidity. It is clear that still there is not sufficient evidence on how to understand and deal with multimorbidity patterns (http://ec.europa.eu/health/ageing/docs/ev_20151007_frep_en.pdf) and consequent patients' behavior toward adherence. Following the above need, patient adherence to medical plans represents a focus of the European Innovation Partnership on Active and Healthy Ageing (https://ec.europa.eu/eip/ageing/), originally set up by European Commission. 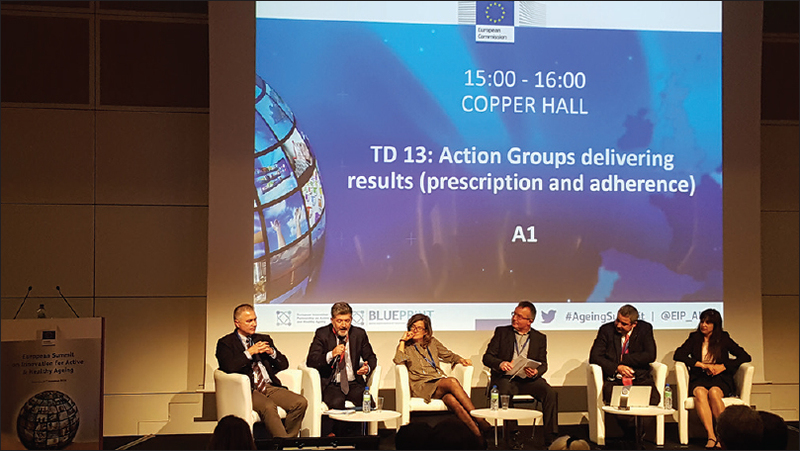 A clear reflection of this fact is the foundation of Action Group (AG) A1 “Prescription and Adherence to Medical Plans” (https://ec.europa.eu/research/innovation-union/pdf/active-healthy-ageing/a1_achievements_2015.pdf). To address this need AG A1 adopted an action plan where it identified the most relevant areas of activities to address the adherence problem. General objective 4: Exploit the potential of ICT for better adherence. [Figure 1] representatives of the A1 AG during the European Summit on Innovation for Active and Healthy Ageing (https://ec.europa.eu/eip/ageing/events/european-summit-innovation-active-and-healthy- ageing-transforming-future-health-and-care_en): Transforming the future of Health and Care in Europe. Implementing tailored ICT-based interventions. We expect that the knowledge that will be created will support stakeholders to take action in the direction of improving the quality of life of the elderly population. Progress in ICT can facilitate personalized solutions for better prevention and engagement in active and healthy aging. These advancements supported by the digital transformation in health and care and the computerization of medicine can support adherence in therapies while empowering the active role of patients in self-managing their diseases. The objectives of the A1 synergy and G04-A1 group are to provide an overview of how advanced information technologies of decision support applications, AI and IoT can create a monitoring environment that could increase adherence to treatment of older age adults with multiple chronic diseases and long-term therapies and appropriate polypharmacy. [Figure 2] shows more than 100 entities (universities, Small and Medium Enterprises, Research Centers) are participating in the A1 synergy group. Furthermore, within the framework of their activities these groups identified the need to study how integrated care systems can support polypharmacy and to understand which role integrated care systems, applications and monitoring data can play for measurement of adherence and of changes in the patient's behavior and lifestyle. Integrated care systems have the potential to respond to the challenge of providing good qualitative and sustainable care to patients with multimorbidity. It is characterized as patient-centered, proactive and well-coordinated multidisciplinary care, using new technologies to support patients' self-management and adherence to medical plans and improve collaboration between caregivers. So far, there is insufficient evidence for the beneficial effect of integrated care on patient outcomes, patient adherence, health-care utilization and costs. Thus, a scoping study has been initiated to review best practices and available literature and to assess whether integrated information systems that connect patient with health-care professionals can boost adherence to old age people in long-term therapies and polypharmacy. The study is a working document within the realm of the EIP on AHA synergy group with an intention to inform the EU of the current status of and gaps in available ICT technology in use. A scoping study has been adopted because it can provide synthesis and analysis of a wide range of research and nonresearch material to provide greater conceptual clarity about a specific topic or field of evidence  and then set this within policy and practice contexts. The scoping study will adopt the methodological framework proposed by Arksey and O'Malley  since this framework provides a supportive foundation for scoping study methodology. Recommendations for each stage of the framework, followed by considerations for the advancement, application, and relevance of scoping studies in health research have also been proposed. The objectives that are set for the scoping study are as follows. Supporting necessary changes in the direction of improving elderlies' quality of life. To identify and review a relevant number of ICT tools for adherence in long-term therapies and polypharmacy and identify the best-in-class. The study will review best practices and available literature to assess whether ICT-based applications that support monitoring of behavior, training, patient empowerment and social interactions can change behavior and increase the adherence of older age adults to treatment. Results from running pilots and relevant data sets from similar studies in EU will be explored. The study will consider technological platforms and solutions and will examine existing technical solutions along with semantic interoperability requirements. Furthermore, we will study how advanced ICT developments such as decision support applications, big data, and others can create a monitoring environment that will increase appropriate polypharmacy minimizing adverse events like falls. The results of this study will help us. To understand the feasibility of introducing ICT tools and applications dedicated to adherence within the realm of integrated information systems that connect patient with health care professionals and other stakeholders (e.g., patients, family members, health and social carers, and members of municipalities, hospitals, social care entities). The role of pharmacists will be considered. To find evidence where possible of the impact of ICT tools for Adherence in Health Services. Impact is defined as the effect of the use of ICT tools for adherence on financial savings and quality of life. The study will try to provide a reference of the requirements that an ICT adherence system should comply to and provide an architecture design methodology and the key technological building blocks that should be adopted. Marengoni A, Angleman S, Melis R, Mangialasche F, Karp A, Garmen A, et al. Aging with multimorbidity: A systematic review of the literature. Ageing Res Rev 2011;10:430-9. Bower P, Macdonald W, Harkness E, Gask L, Kendrick T, Valderas JM, et al. Multimorbidity, service organization and clinical decision making in primary care: A qualitative study. Fam Pract 2011;28:579-87. Smith SM, Soubhi H, Fortin M, Hudon C, O'Dowd T. Interventions for improving outcomes in patients with multimorbidity in primary care and community settings. Cochrane Database Syst Rev 2012;4:CD006560. Nuño R, Sauto R, Toro N. Integrated care initiatives in the Spanish Health System/Experiencias de integración asistencial en el Sistema Nacional de Salud de España: Abstracts from the Third Spanish Conference on Chronic Care, San Sebastián, 19–20 May 2011/Resúmenes de Comunicaciones al III Congreso Nacional de Atención Sanitaria al Paciente Crónico, Donostia-San Sebastián, 19 y 20 de mayo del 2011. Int J Integr Care 2012;12 Suppl 2:e35. Duerden M, Avery T, Payne R. Polypharmacy and medicines optimisation. Making it safe and sound. The Kings Fund; 2013. Available from: https://www.kingsfund.org.uk/sites/files/kf/field/field_publication_file/polypharmacy-and-medicines-optimisation-kingsfund-nov13.pdf. Moen J, Antonov K, Larsson CA, Lindblad U, Nilsson JL, Råstam L, et al. Factors associated with multiple medication use in different age groups. Ann Pharmacother 2009;43:1978-85. Sabaté E. Adherence to Long-term Therapies: Evidence for Action. Geneva: World Health Organization; 2003. Ritchie C. Health care quality and multimorbidity: The jury is still out. Med Care 2007;45:477-9. Hughes LD, McMurdo ME, Guthrie B. Guidelines for people not for diseases: the challenges of applying UK clinical guidelines to people with multimorbidity. Age Ageing 2013;42:62-9.
de Bruin SR, Versnel N, Lemmens LC, Molema CC, Schellevis FG, Nijpels G, et al. Comprehensive care programs for patients with multiple chronic conditions: A systematic literature review. Health Policy 2012;107:108-45. Davis K, Drey N, Gould D. What are scoping studies? A review of the nursing literature. Int J Nurs Stud 2009;46:1386-400. Anderson S, Allen P, Peckham S, Goodwin N. Asking the right questions: Scoping studies in the commissioning of research on the organisation and delivery of health services. Health Res Policy Syst 2008;6:7. Arksey H, O'Malley L. Scoping studies: Towards a methodological framework. Int J Soc Res Methodol 2005;8:19-32.